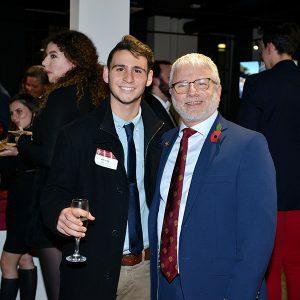 With all the elegance and sparkle of the British capital, Fordham opened its new London Centre campus in the city’s Clerkenwell neighborhood on Tuesday, Oct. 30. The ceremony marked the official dedication of the new campus, which will be home to American university students as they study and immerse themselves in the storied culture of the U.K.’s cosmopolitan city. As the scent of rosemary, mint, and roast pork wafted from the gleaming new kitchen off the student lounge, Joseph M. McShane, S.J., president of Fordham, reminded students, faculty, alumni, and staff of a time when such copious consumption once spelled doom for a group of Jesuits who lived in hiding nearby at a time when anti-Catholic sentiments ran high. The year was 1628, he said. Protestant shopkeepers began to notice an unusual amount of “provisions and necessaries” being carried in to the Jesuits’ quarters. “This excited their suspicion,” said Father McShane, reading from a 17th-century account of the events. “They, therefore, gave notice and the house was surrounded about 9 o’clock in the morning. The authorities broke in and searched the house from top to bottom. The rector was found and taken … Others were caught elsewhere. … Only one was condemned to death, having admitted the fact of his treason,” he read. “Three hundred and ninety years later, the Jesuits have returned to Clerkenwell!” he said to laughter and applause. The evening began with an inaugural Mass of the Holy Spirit at St. Peter’s Italian Church, which sits just a stone’s throw from the London Centre on Clerkenwell Road. In his homily the Right Reverend Nicholas Hudson, auxiliary bishop for the Diocese of Westminster, encouraged students and professors at the new center to seek wisdom beyond the classroom and their careers. He told the story of Canadian philosopher Jean Vanier, who eschewed a life of wealth to work closely with disabled adults. One of those adults, Antonio, was a paraplegic with a radiant smile. After Mass, the crowd headed back at the new campus for the ribbon cutting and dedication ceremony. 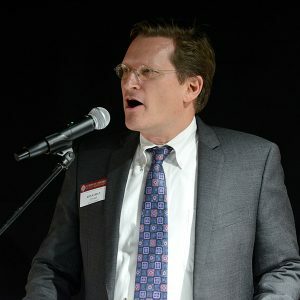 There, Jonathan M. Crystal, Ph.D., interim provost, gave a brief history of Fordham’s four-decades in London, beginning when leadership at Marymount College of Fordham and a group of instructors from the Royal Academy of Dramatic Arts established the London Dramatic Academy (LDA), a conservatory steeped in the British acting tradition, in Brownlow Mews. By 2009, Fordham moved from that location to a larger space at the University of London’s Heythrop College in Kensington Square, adding both business and liberal arts curricula. Crystal credited a meeting between the former dean of Marymount and the principal of Heythrop College with expanding Fordham’s London campus to 3,500 square-feet. Crystal then ceded the floor to students, several of whom sang an appropriately-themed song by Leonard Bernstein titled, “Build Me a House.” After the performance, deans, donors, and students joined together to cut the ribbon with giant scissors, officially opening the center. Charlie Arnedt, a junior at Fordham College at Rose Hill, took a moment to thank the faculty and staff of the center for help personalizing the city he’s called home since August. He said had no idea how immersive the London program would be through coursework and class excursions. He spoke of visiting the Imperial War Museum and feeling its visceral memory of the Great War, hearing the acoustics of the Royal Albert Hall, and observing “the height of empire and scientific achievement at the world’s meridian at the Royal Greenwich Observatory. The center is a campus for students from Fordham and other universities to study abroad and immerse themselves in the culture of the city as well as the continent. For some students, it serves as launching point for long weekend sojourns to Paris and other European cities. 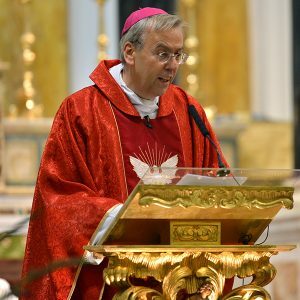 “We are fortunate that London is a global capital that not only represents the U.K., but also represents all the many cultures of the world; this is a crossroads and has been for centuries,” said Richard P. Salmi, S.J., head of the London Centre. Every semester, dating back to when Fordham London Centre was at Heythrop College, the Office of Student Affairs arranges trips to the continent. Through a partnership with Loyola Chicago’s Rome Center, Gabelli School students can hear lectures and take tours from local professors and celebrate Mass at the Vatican. Liberal arts students have visited Vienna and Berlin in the past. This spring they will be going to Lisbon. And more locally, student affairs arranges group trips to sporting events and the theater. The newly renovated London Centre campus began as two Victorian-era buildings—probably built for commercial use—that were later combined to form the offices and manufacturing plant of Winstone Printing Inks, which served nearby Fleet Street newspapers. A north wing was added, most likely in the 1920s or ’30s. The vibrant student-friendly Clerkenwell neighborhood is a former industrial neighborhood that built a new reputation as design and tech firms began moving in during the 1990s. It’s close to the city’s financial district, West End theaters, the British Museum, and St. Pancras International Railway Station (with trains that can reach Paris in less than three hours). Leather Lane, across the street from the center, is an outdoor market with dozens of small trucks serving up a variety of street food, from Spanish paella to Vietnamese pho. Down Clerkenwell Road, near St. Peter’s, an Italian grocery and a Roman pizzeria cater to the area’s Italian community, while just a bit further up the road, Turkish barbers offer a cut and shave. Undergraduate classes are currently open to students registered full time at a U.S. college or university. Students hail from St. Louis University, Marquette, Loyola Marymount, Loyola Chicago, Cornell, and Pomona College, to name just a few. The London Dramatic Arts program typically accepts 24 students and the undergraduate programs are nearing capacity for this coming spring with more than 300 students. Undergraduate students can start attending Fordham London Centre in the second semester of their sophomore year and should maintain a 3.0 average. Alongside with LDA, the center’s programs are split between the Gabelli School of Business and the liberal arts. Liberal arts courses are open to all undergraduates from Fordham College at Rose Hill, Fordham College at Lincoln Center, the Gabelli School, and the School of Professional and Continuing Studies. Students take 15 credits a semester. The center also offers an internship program where some students work two days per week alongside their coursework. Placements in the past have been in the fields of marketing, international relations, television, health science, and banking. “Increasingly, over time, the students are more interested in international internships,” said Harrington, adding that 35 students have already been placed for the spring. On the graduate level, some schools have programs that are up and running, such as the Graduate School of Social Service’s summertime course on settlement houses. Debra McPhee, Ph.D., dean of the Graduate School of Social Service, joined several Fordham deans in London for the dedication. She held a meeting on Oct. 29 with U.K. settlement house leaders to deepen ties and explore the possibility of student placements. “We continue to look at initiatives that will bring the community into the school and the school into the community, which is an objective at home too,” said McPhee, adding that her fellow graduate school deans were equally excited by the opportunities. It’s a spark that has captured undergrads as well, said Maura Mast, Ph.D., dean of Fordham College at Rose Hill. 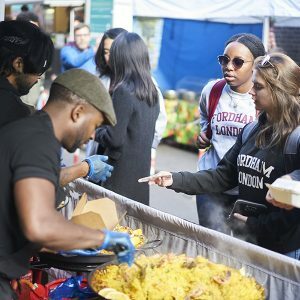 Mast said students who often find themselves studying alongside peers who share their major tend to interact a bit closer with other disciplines on London’s more intimate campus. Mast said she also noted that the “Fordham is my school; New York is my campus” ethos swaps well with London. Some of the courses offered reflect immersive experiences in liberal arts, such as an Art and Architecture course that takes place every other week on the streets of London. Likewise, a Writing London course include a Harry Potter walk, while a course on Shakespeare includes visits to the theater. “A big part of Fordham’s educational approach is applied learning, using the city as our campus, and London provides a new whole way to do that,” Donna Rapaccioli, Ph.D., dean of the Gabelli School of Business. Courtney Welyczko, a junior at the Gabelli School of Business, said using the city as a campus will be something she can carry into her career and into other cities as well.